Football Index is an innovative platform that allows fans to become traders on a football stock market, using their knowledge of the game to make money. This overview explains how it works, including Football Index referral code information, sign-up details and tips and advice. Please note that, unlike matched betting, Football Index is gambling. Traders (i.e. punters) invest in players in the hope that they will perform well, demand for them will rise and their value will go up. Investing in a player is known as buying a "Football Future". 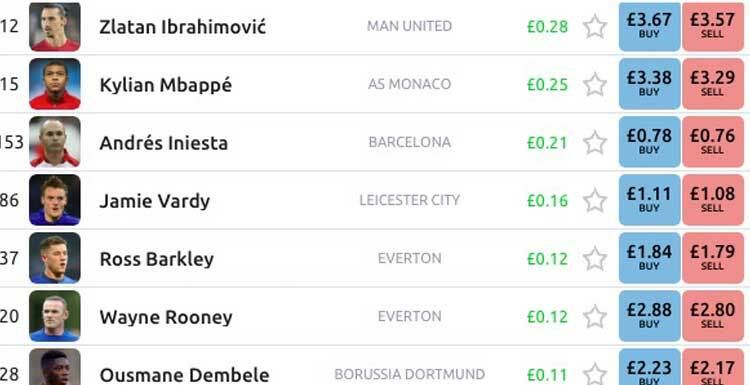 Players can also earn traders dividends by topping the Football Index Buzz charts - by being the most talked about in the media on any given day or by performing well on the pitch. Football Index is a bit like fantasy football in that it requires punters to speculate which players will do well, but you don't have to pick a team - you can invest in just one player if you like. It is a form of gambling as risk is involved. However, unlike spread betting, traders cannot lose more than their original stake. 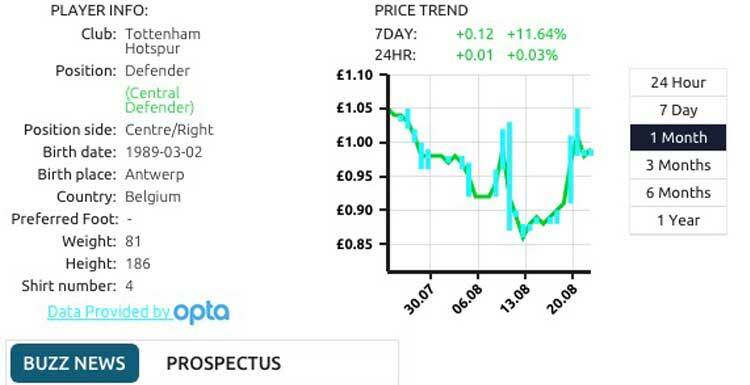 In simple terms, you are betting on a a player topping the Buzz chart as many times as possible to reward you with dividends but money can be made and lost on buying and selling shares in players (Football Futures) as the price changes. Football Index might sound a little complicated, especially for fans with little knowledge of stocks, shares and trading but, basically, if you know your football you have a chance of making some money. It can be played on desktop, mobile and tablet, with iOS and Android apps available. Traders invest in players they think will rise in value. The value of players is determined by two factors: 1. The demand from other traders and 2. How much media coverage they get. Players with a lot of media coverage on any given day have a chance of topping the Football Buzz and earning a dividend on that day - for every share held in that player. 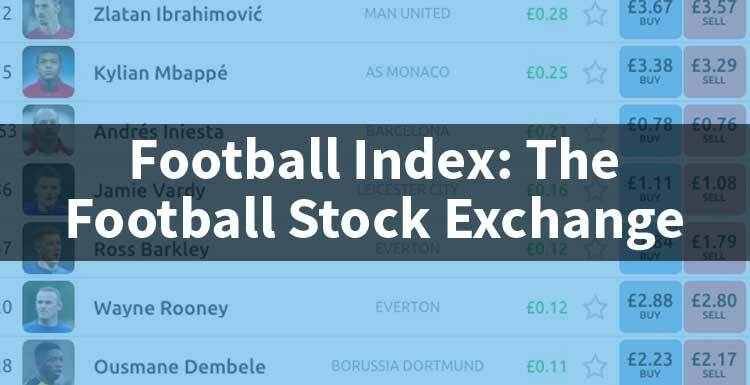 The Football Index Football Stock Market opens at 6am GMT and closes at midnight GMT. Player values go up and down depending on how much demand there is for them. There are 200 players to choose from in what Football Index calls the First Team list. Traders can build up a 'portfolio' by investing in several players. The rest of the players (not in the First Team 200) are known as "The Squad". Traders can cast votes on these remaining players to be added to the First Team. The two most popular players are promoted to the First Team 200, replacing the two lowest players every Friday. 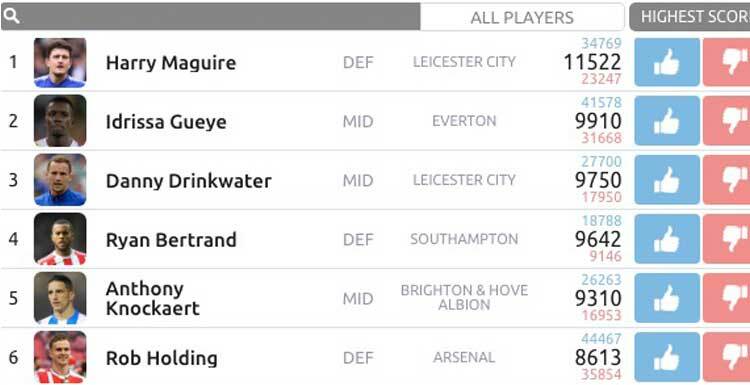 When players are relegated from the Football Index First Team, all futures are null and void. Traders can request players to be added to the squad. The Media Buzz ranking is determined by looking at 25 UK football news websites on any given day. These are: Talksport, UEFA, The FA, ESPN, FIFA, Football League, Daily Mail, Daily Star, The Times, Telegraph, Independent, Daily Express, The Guardian, Metro, Daily Mirror, BBC, Football365, Goal.com, Huffington Post and Sky Sports. 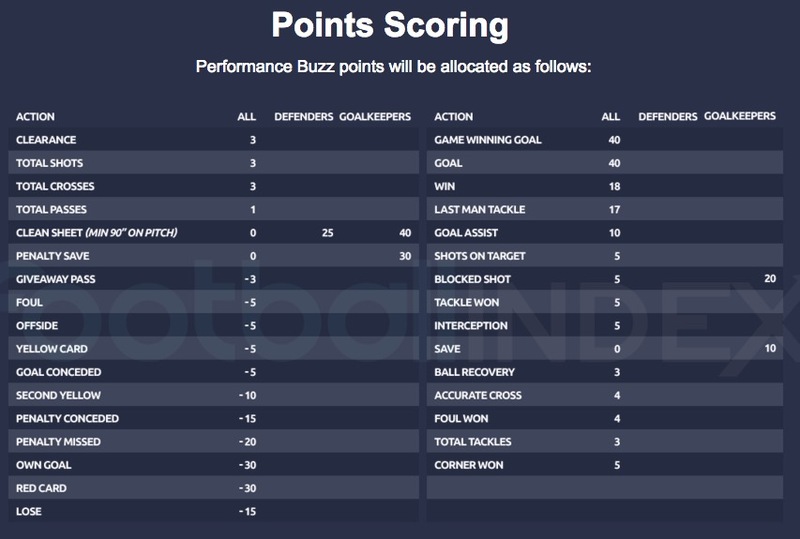 From August 19 2017 performance buzz charts have also been in place, rewarding players for on-field performances with data provided by Opta. Dividends are paid out between midnight GMT and 1.30am. The Footie Index is represented like a stock exchange ticker, shows the market cap of all 200 footballers in the first team list. The Footie Index was launched in October 2015 with a base value of 1,000 points. A tracker is a way of bulk-buying players to spread risk and track the performance of the Football Index as a whole. Traders can buy from 1 to 100 shares in each of the top 25, 50 or 100 players on the first team list. When it comes to selling players on Football Index, you just need to click the sell button. Clicking 'sell' is a bit like a lay request at a betting exchange - it is not guaranteed as you need to have another trader prepared to take on the Future at that price. The sale will not be instant and the price is not guaranteed but traders can set a reserve price (a little like Ebay) and the sale request can be cancelled at any time. How long does it take? Sales are made on a first-come, first-served-basis so the traders who clicked 'sell' earliest will be the ones who sell first at a given price. Because Football Index is relatively new, no average time for sales has yet been published. On occasions, Football Index will act as 'market makers', meaning they will buy the player being sold and hold the future until a buyer is found. This is to help create market liquidity. How does Football Index make money? Football Index charges a 2% commission fee on the sale of futures. The registration page has room for a Football Index referral code but there is currently no discount code available. However, now players can try the football stock market with a £500 risk-free offer for one week using this link. Football Index for beginners can be quite daunting - there's a lot to take it. However, the football stockmarket has a wealth of resources to help beginners, including instructional videos, a regularly updated blog with regular and guest columnists offering advice and daily Football Index tips. "The idea behind it is genuinely game-changing. Now is the time to get onboard because it's going to go through the roof." "I've said to a few friends they should be joining the Football Index. The issue I get most is 'have I missed the boat?'. The answer is no, we're just beginning." "It's much better than leaving your money in a bank account, where you get nothing at all. You might lose a few quid on a player but you'll make money on other players. You can get a good return." "It's good to see your guesswork and intuition come good. The returns you can make are 20% to 30% upwards. I invest in tradition stock markets as well but this is a lot more exciting. High risk but high returns, the volatility involved means it's good fun." "Football Index is definitely growing. If you know what you're doing, you know your players and you want to make some spare cash on the side, I'd say definitely give it a go." How do I make money on the Football Stock Market? 1.By buying a portfolio of Footballers that you think will earn you Dividends over a period, by topping the Buzz Chart. 2.By buying a portfolio of Footballers that you think will increase in value, as a result of increased demand, enabling you to cash out your bets at a profit – buy low, sell high. How might I lose money? Unlike spread betting you can never lose more than your stake, and for you to lose all of your stake your Futures would have to be of no value in the market, and for you not to receive any Dividend payments on them. Futures are valid for a maximum of three years or for the lifetime of the footballer on the First Team list. If your Footballer looks in danger of being relegated from the 1st Team your Futures will certainly be worth less, if not valueless, and you will lose part if not all of the value of your Futures. What is a Football Future? It’s an individual fixed-odds bet on the Daily Buzz Winner, providing many opportunities to win small GBP 0.05 payouts known as a Dividends. It’s price is determined purely be demand – the more Lionel Messi Futures we sell the higher his price – there are no external factors such as media mentions or column inches. Futures are available to buy on all Footballers featured on the 1st Team at the published price, and are valid for the period the Footballer remains on the List. There is no limit to the number of Dividends that may be won per Future. Futures are valid for a period of three years from issue after which date they become null and void. When the Footballer is relegated from 1st Team the bet is terminated and of no further value. As a bet for the duration of a Footballers ‘career’ in the 1st Team, it may be ‘cashed out early’ … or sold. Football INDEX will ‘cash out’ a Future providing there is another Trader willing to take on the Future at the published price. On occasion Football INDEX may buy back Futures to create liquidity in the market, and speed up the selling process - this is known as market making. A 2% commission is charged to the Seller on sales of Football Futures. How is the value of player shares determined? The Price of a particular future is determined by the number of other futures in that Footballer in existence – i.e the number of bets we have issued in that Footballer. 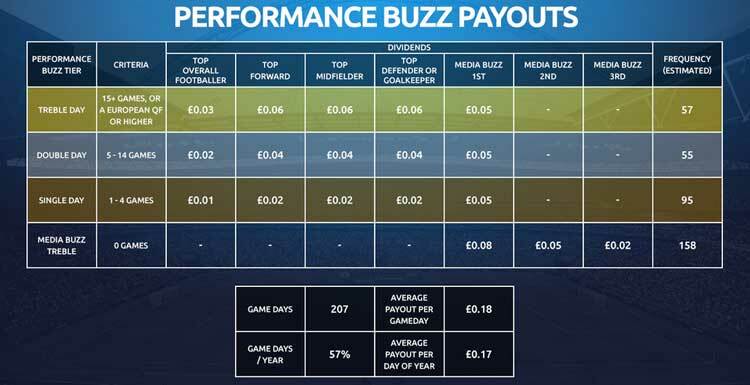 There are no external factors such as the Buzz score that affect the price, it is purely driven by demand within the game. The relationship of price to volume of Futures is derived from our proprietary pricing algorithm, which states that if we issue another 100 Futures the price will go up to ‘x’. Sale requests are taken in strict chronological order – so if you’re the first to hear the news of Ronaldo’s accident and press ‘sell’ then yours will be the first to be ‘sold’. However a lot of other people may also wish to sell, depressing the price that you ultimately receive.The same is true if demand for Ronaldo drops, if say he breaks his leg and a lot of people want to sell. The price will then reduce incrementally as more sales are requested, with no buyers. You may set a reserve price below which you do not wish to sell, and you may cancel your sale at any time by clicking ‘cancel’ button in your portfolio. In certain instances we may act as ‘market makers’ to create liquidity in the market. This means that we will buy back Futures that are ‘for sale’ before there is a buyer for them, and hold them until such time as there is. In this instance we sell them on at exactly the price that we bought them with no spread – so we guarantee to never profit from sales by more than the 2% transaction fee charged. What does the padlock symbol mean? When players are promoted into the First Team, they are safe from relegation for a period of 8 weeks. When a player has a blue padlock on their profile picture they are safe from that week's upcoming relegation. Traders must be over 18 and must pass identity checks by providing relevant documents.